We’ve taken the first steps towards our debut CD. Using a keyboard scratch track and click, Glenn and I recorded 14 tunes yesterday. We just barrelled through everything…no playbacks and only a few second takes. Special thanks to Chris Ariza for his ingenius mic setup. 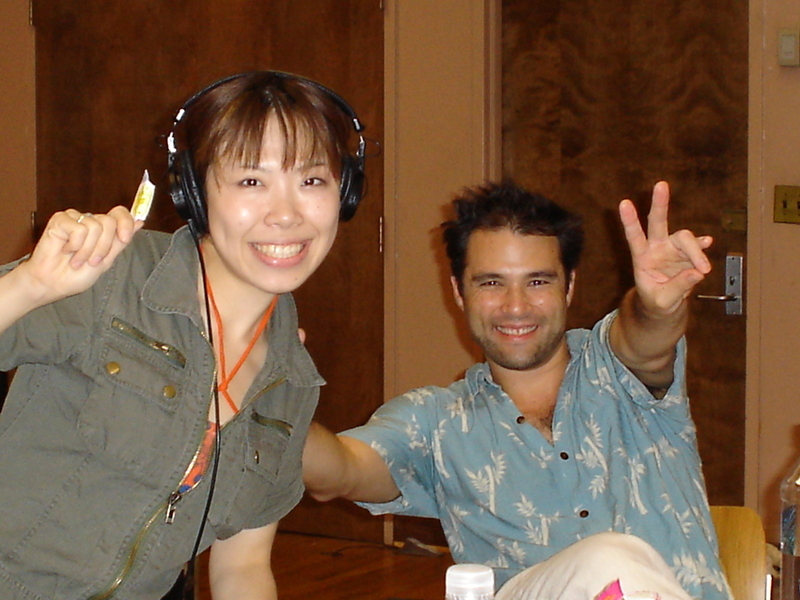 Miho, Brian, and Rodrigo went into the studio and recorded all their vocal parts. Check the pics. As my dissertation focuses on "classical music" composers as imagined in popular culture, I was psyched to see the posting for "Riot at the Rite" on youtube.com today. I had heard about the dramatization of the Sacre premiere on various blogs, but I thought I'd have to wait to see it. Thank goodness for youtube users. I don't know if there is anything beyond the four postings, so I can't say anything conclusive. But from what I've seen, the drama brought out not only the physicality of the dance, the sweat, breathlessness, and tension, but re-emphasized the newness of the Stravinsky score. Having taught this piece to many students, I *do* get a glimpse of this in the classroom: the skepticism, the unimpressed or disgusted looks, the impatience. But the drama allowed me, in a way, to experience the feeling within the theater. Yesterday ended up being very productive for KIOKU. We hustled to get some photos taken before Ali leaves on his Cali tour. We recruited the charming and talented Andrea, and she managed to take 105 pictures of us up on Chris’s roof. Our NYC weather has been a bit unpredictable, so we had around twenty minutes of sun and then twenty minutes of overcast skies. I have to hand it to her, she managed to make the three of us look presentable! Ali came straight from his school gig, so he had to borrow one of Chris’s black shirts. A bit too large, but with the help of two strategically-placed clips, it was fine. Every once in a while, Ali ended up showing a lot of chest hair, but don’t worry, we’ll be treating him to a full-body shave soon. Afterwards, Chris and I worked on the audio clips. Photos and audio will be up on the website soon! HAPPYFUNSMILE has been on vacation for a bit. 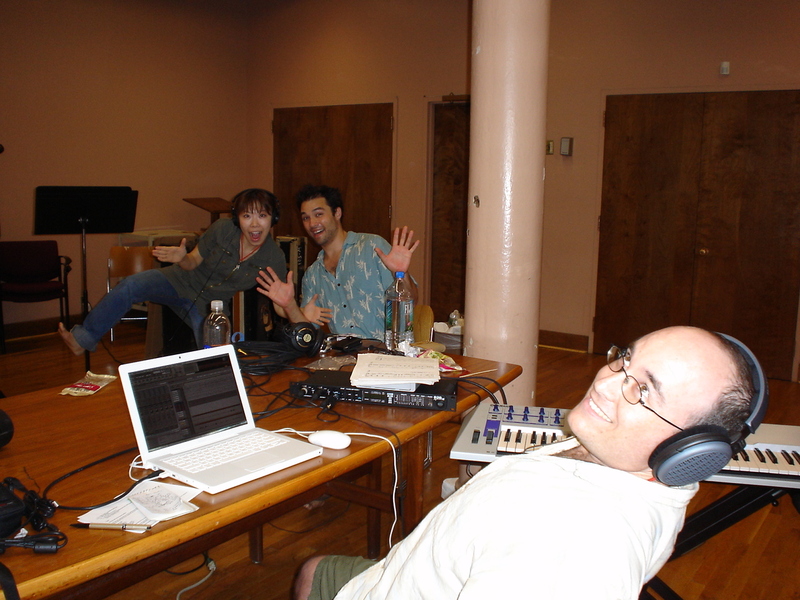 Our last gig was at the New York Buddhist Church potluck fundraiser and was a lot of fun. But after numerous gigs this spring, HFS needed a break. We're hoping to head into a recording studio soon. It'd be nice to have a CD, but I'm worried about the time and expenses. Plus, half of the band will be out of town during June and July. 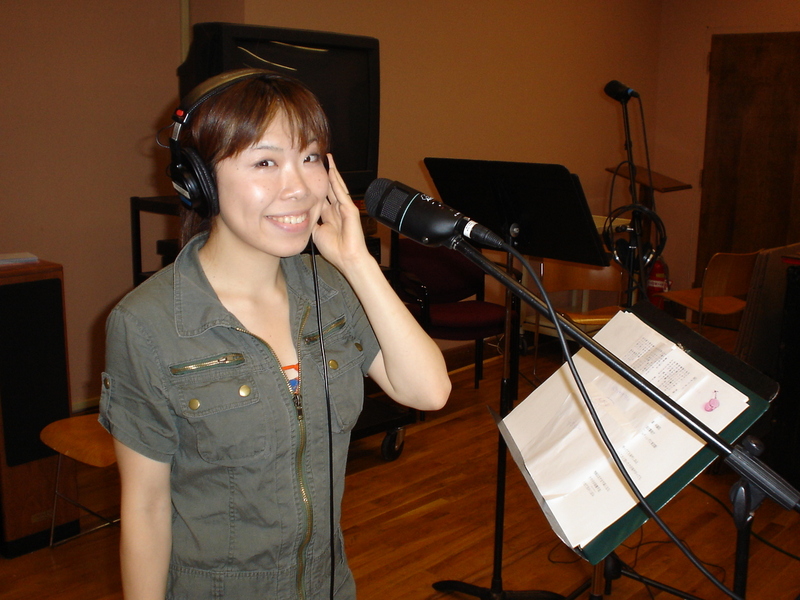 Oh, and our lead female singer Miho will be returning to Japan in August. Big loss for NYC and HFS! But hopefully we'll meet up with her again in Japan–maybe the Toyama Chindon Festival 2007! Last night I had a few drinks with Sanford, the bassist for Gaijin a Go-Go. We had a great conversation, although we kept getting interrupted by weird Sunday evening events. There was a singer-songwriter at Ding Dong Lounge who was unbearably bad, so we moved to another bar where we encountered a two-stage trivia contest. All we wanted to do was talk…so we finished our drinks (coming in second to last in the trivia contest) and returned to Ding Dong for a nightcap. Hopefully, HFS and GGG will team up again in the fall. We're thinking about university gigs around the Tristate area. Lots of work…but could be worth it! Traditional, arranged by SAMULNORI, reconceived by Wynn Yamami, realized by KIOKU. This Korean prayer song was once performed by shamans to invoke blessings from various deities and ancestral spirits. The drumming group SAMULNORI adapted this prayer and combined it with rhythms derived from rural music traditions (nong-ak, also referred to as pungmul, poongmul, poongmul-nori). Formed in 1978 by Kim Duk Soo, SAMULNORI takes its name from the “four instruments” to be played: the kwaenggwari (small hand-held gong), jing (larger gong), janggu (hourglass-shaped drum), and buk (barrel drum). The present arrangement begins with Pinari (transferred from the voice to the alto saxophone) and includes rhythms and melodies from the Chungbu, Honam, and Youngnam regions. Traditional, reconceived and realized by KIOKU. Kulintang (or kolintang) refers to an instrument consisting of eight small gongs in graduated sizes and the overall ensemble which can include larger gongs (gandingan, agung, babandil) and a drum (dabakan). This musical tradition developed on the Filipino island of Mindanao in two adjacent provinces: the Maranao (people of the lake) and Magindanao (people of the flood plain). Used as a means of social interaction, entertainment, and a necessary component within healing ceremonies, kulintang represents a rich social and musical tradition. Since the 1960s, kulintang has been introduced to a wider audience by such scholars and performers as José Maceda, Robert Garfias, Danongan Kalanduyan, and Usopay Cadar. The title “Binalig” refers to an improvised and rhythmically-complex piece, but is also related to “balig” with implications of informality and foreign-ness. The present arrangement consists of three overlapping movements and was developed by KIOKU. John Coltrane with Jimmy Garrison and Elvin Jones, realized by KIOKU. Aside from his innovations in timbre, phrasing, solo development, and composition, the saxophonist John Coltrane embodied the connection between music, the self, and spirituality. His musical explorations of “African-ness” as an African-American served as an important example to others in search of musical “roots.” While Crescent (1964) is usually not discussed in this context (perhaps due to its close chronological proximity to the hugely-influential A Love Supreme), the album contains a remarkable improvisational feature for drummer Elvin Jones entitled “The Drum Thing.” As realized by KIOKU, this musical meditation retains the haunting melody and redistributes the bass pulse and drum set phrases to laptop, taiko, and cymbals. Traditional, arranged by Kondo Katsuji and Tomida Kazuaki of KODO, reconceived by Wynn Yamami, realized by KIOKU. On the remote volcanic island of Miyake-jima off the eastern coast of Japan, a drumming style developed that, to some, mirrored the strenuous physical movement of fishermen reeling in their nets. This distinctive rhythm and performance style (crouching low to the ground) was made famous through an arrangement by Kondo Katsuji and Tomida Kazuaki of the drumming group KODO. In most performances, KODO precedes “Miyake” with a fisherman’s song (“Okiage”) from Hokkaido. The present arrangement replaces the angular arm movements with a flowing style, adds an allusion to the rhythms of Hachijo-jima, and introduces a second folk song lamenting the decline of fish off the coast of Esashi, Hokkaido (“Esashi Oiwake”). AMBIENT WORKS composed and realized by Christopher Ariza. THANK YOU to all our friends and supporters, including the New York University GSAS Music Department, Michael Beckerman, Elizabeth Hoffman, Pauline Lum, Lawren Young, Ryan Dorin, the Washington Square Computer Music Studio, and Soh Daiko. 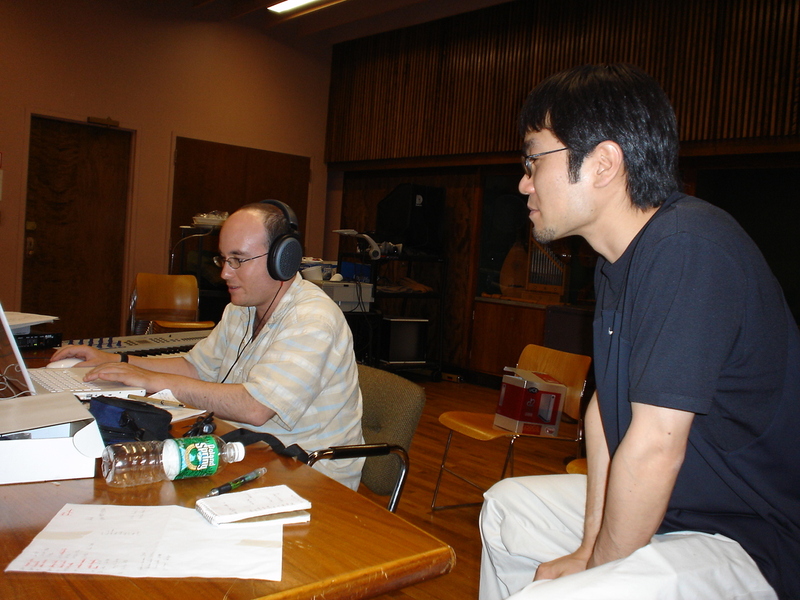 You are currently browsing the wynn yamami blog archives for June, 2006.